I think Truman really did like, and personally know, 4-H. He apologized to another group of 4-H’ers saying, “There is one thing I overlooked this morning. I forgot to put on my 4-H button, for which I apologize.” Truman made many speeches from the end of a train as it moved from town to town while he was in office and in many of those speeches, he’d reference 4-H. Yup, Harry liked 4-H. Funny but I just can’t imagine Clinton and Richard Nixon (#37) agreeing on much, but they apparently agreed on 4-H! Hmm, could that be a “4-H GROWS HERE” reference? Calvin Coolidge (#30) was a president many thought of as a stern man of few words. But 4-H’ers did make him laugh when they paraded past him with a sign that read, “We like Coolidge ’cause Coolidge likes us.” It must have been true ’cause 4-H’ers never lie, right? Every President since William Howard Taft (#27) – all 18 of them, including our present President, Barack Obama (#44) – has met with 4-H members, discussed the future with them, given 4-H’ers encouragement, asked them for help (FDR [#32] even asked 4-H’ers to rededicate their heads, hearts, hands, and health to VICTORY in 1945! ), and thanked them for what they’d given America. In January, 2017, #45 will be inaugurated. We don’t know who that will be yet, but we can be sure 4-H will be present at the start (Check out the Inauguration CWF opportunity recently announced). Will he or she meet with 4-H’ers? He or she will if we, as John Adams suggested, exert our head, heart, and hands all together toward that goal! 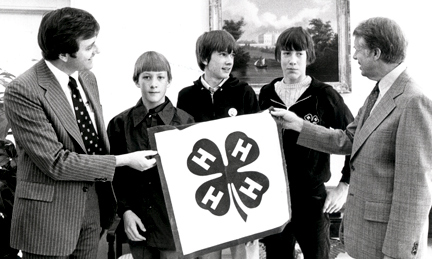 For more information on U.S. Presidents and 4-H, visit the 4-H History Preservation website. This entry was posted in History and tagged 4-H History, Jimmy Carter by Ron Drum. Bookmark the permalink.